Nuns in deep purple habits and white veils that flap in the wind as if in flight, rosary beads sashaying from their waists. Everything else is silent as they hurry down the path, except for the scurrying of little feet drawn into the chapel by the clanging of bells. My Kindergarten is scary, I thought. Climbing up the dark marble staircase always gave me the creeps. Specially when Ms. Catherine was waiting on the landing, so serious and stern, white as a ghost, and always smelling of baby powder or Ivory soap. But the sight of her also meant it was lunchtime, and she would be taking us to the cafeteria! 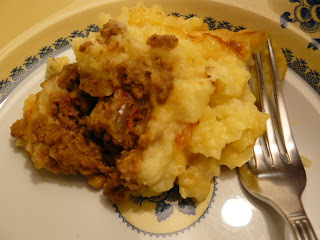 There the lunch ladies would pamper us like surrogate grannies, serving an extra heaping spoonfull of warm Cottage Pie. Each dish was lovingly cooked fresh, from the jam tarts to the pork dumplings to the beef stew and rice. Here was my refuge from the scary, new world of Kindergarten. And the food was always good. So when I found this recipe in an old magazine, I wondered whether the boys would find this as comforting as I had then. What food brings back your childhood memories? 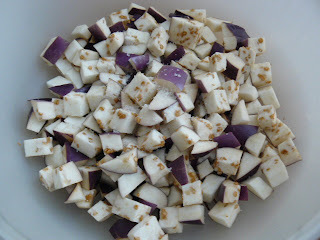 Place eggplant on a colander and sprinkle with salt. Let stand for at least 30 minutes, over a plate to catch the extracted liquid. After half an hour, squeeze eggplant to remove remaining liquid, and pat dry. Heat oil in heavy large pot over medium-high heat. Saute eggplant until tender. 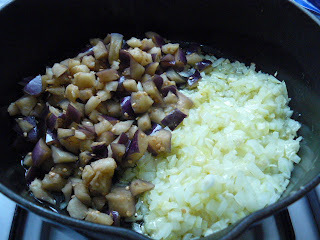 Add onions and 4 cloves minced garlic and cook until softened. 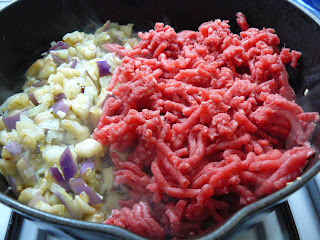 Add minced beef and saute until cooked. 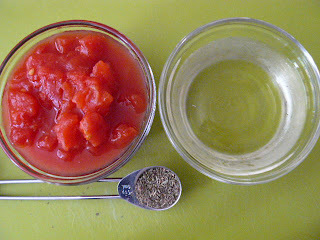 Add oregano, tomatoes, bouillon cube and wine, and boil over high heat until liquid almost evaporates completely, about 5 minutes. 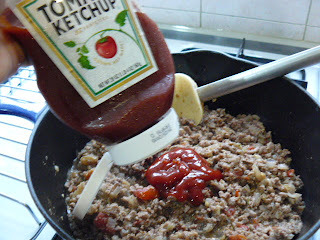 Add a squeeze of ketchup and mix well. Season with salt and pepper. Transfer to a glass baking dish. Preheat the oven to 175 deg C. Cook potatoes in a large pot of boiling, salted water until tender. 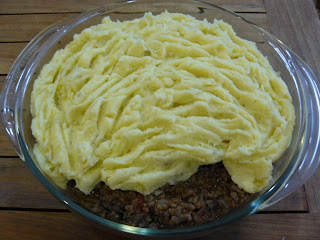 Drain the potatoes and mash until smooth, mixing in the butter, extra-virgin olive oil, 2 cloves minced garlic and milk. Season with salt and pepper. 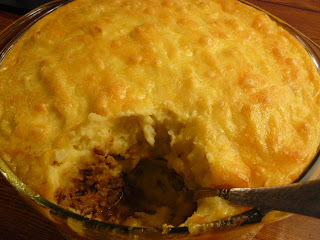 Drop mashed potatoes over the filling and spread evenly, covering completely. Sprinkle cheddar cheese over the top. Bake for about 45 minutes or until topping is golden. yes it's a sneaky way to add veggies, blended into that beef and potatoes and cheese goodness!